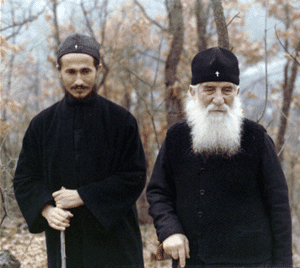 We were closely acquainted with the Blessed Father Justin and we know that he had never broke communion with any of the Orthodox Churches or a Bishop or a Patriarch, not even with the Serbian Patriarch Germanos (1958-1990)– as some zealots ‘shamelessly lie’ — not even when the Patriarch Germanos was one of the ‘presidents of the WCC’ (a formal and honorary title without any binding conditions or duties as indeed was the participation of the Serbian Orthodox Church in the WCC). As a free and responsible member of the Church of Christ, Justin prophetically reproved and, when necessary, criticized in written form (having written a couple of criticism letters to Patriarch Germanos and the Synod, inter alia, the letters pertaining to superficial western ecumenism). Yet on no account did he ever create a schism, but on the contrary used to say: “Schisms are easily made but they are enormously difficult to heal” (therefore he opposed the unwisely made and increasingly deepening ‘American Schism’ just as he was against ‘the Macedonian Schism’). From Notes on Ecumenism. Commentary on Father Justin’s Notes, pp. 36-37.